Friction feed manual folder that sets up easily for a variety of standard and custom folds. 3 roller friction feed system. Easy set-up for standard and custom folds. Control touch panel includes 4 digit counter with addition and subtraction functions. Test button folds 2 sheets for inspection. Extended exit tray for neat stacking of folded sheets. 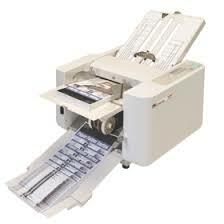 Automatic conveyor ensures smooth ejection of folded paper. Single sheet feeding automatically maintained for different weights of paper. Auxiliary paper guide for cross folding. Load and unload paper from same side. Display alert and audible signal in case of incorrect operation. Skew and micro-adjustment dials. Quick-release roller system for easy maintenance.